As the new chief of staff at The University of Toledo Medical Center, Dr. Thomas A. Schwann is focused on empowering the staff to provide outstanding university-quality care while working to streamline operational processes to maximize their effectiveness. Schwann, who began his appointment as the University’s 25th chief of staff July 1, is the S. Amjad Hussain Professor of Thoracic and Cardiovascular Surgery and division chief of cardiothoracic surgery. He also serves as director of the UTMC Heart and Vascular Center. Because multiple studies have documented that quality and patient satisfaction are enhanced with the increasing personal and professional fulfillment and satisfaction of the health-care provider, it becomes important to take these simple measures that will impact medical staff positively, Schwann said. Board-certified in cardiothoracic surgery, Schwann is a graduate of the Columbia University College of Physicians and Surgeons, and he completed residency and fellowship programs at Yale University. He has a bachelor’s degree in biochemistry from Columbia University and a master of business administration degree from UT. 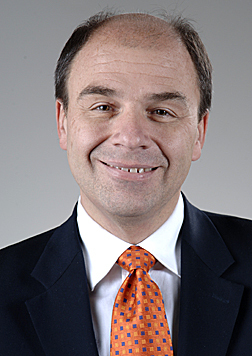 Schwann has been associated with the institution since 1999 and joined UTMC full time in 2009. He previously held chief of cardiothoracic surgery positions at St. Francis Hospital in Hartford, Conn., St. Luke’s Hospital in Maumee and St. Vincent Mercy Medical Center in Toledo. He is a Fellow of the American College of Surgeons, American College of Cardiology and American College of Chest Physicians, as well as a member of the American College of Physician Executives, American College of Healthcare Executives, Society of Thoracic Surgery, European Association of Cardiothoracic Surgeons and the International Society of Minimally Invasive Cardiothoracic Surgery. This entry was posted on Thursday, September 11th, 2014 at 3:19 am and is filed under Alumni, Features, Medicine and Life Sciences, News, UT Health, UToday .